The Marine Corps' Assault Breacher Vehicle (ABV), which became operational in 2009, is similar to but distinct from the Army's Grizzly Breacher, which was cancelled in 2001. The Assault Breacher Vehicle (ABV) is a joint program with the United States Marine Corps as the lead service. The Assault Breacher Vehicle (ABV) is a single platform that will provide deliberate and in-stride breaching capability to the assault force of the Marine Air Ground Task Force (MAGTF). The ABV operates as part of the combined arms task force and is assigned to and employed by Combat Engineers. The ABV is based upon the M1 Main Battle Tank chassis (with out turret) and incorporates a number of subsystems, including a full width mine plow, dual line charges, lane marking system, remote control system, and protective weapon system. The integration of the Breaching Package onto the ABV, which uses the M1 tank chassis, shall require minimal modification to the chassis. The Assault Breacher Vehicle (ABV) is a tracked, armored engineer vehicle specifically designed for conducting in-stride breaching of minefields and complex obstacles. The ABV provides crew protection and vehicle survivability while having the speed and mobility to keep pace with the maneuver force. 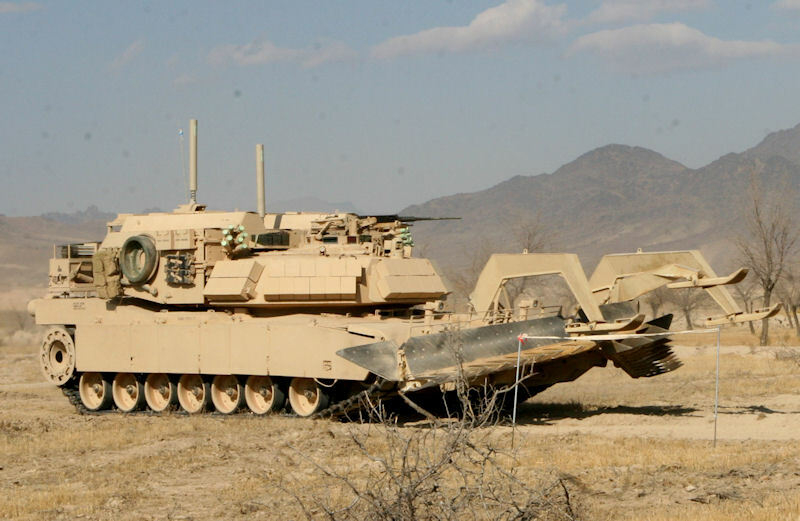 Major components of this system include a Full-Width Mine Plow (FWMP), two linear demolition charges (LDC), a lane-marking system, a remote control system, and weapon station integration on a modified M1A1 tank chassis. ABV will fill the requirement to clear a lane of sufficient width and depth for the assault forces and is operated by a two-man crew with an option for remote control. The ABV improves the mobility and survivability of MAGTFs. The ABV will provide a deliberate assault breaching capability through minefields and complex obstacles. It will allow assault units to move rapidly through obstacles before threat forces have the full opportunity to mass fires or establish defenses. Marine Corps Systems Command granted Milestone B in July 2003, as well as authorization to build three Production Representative Prototypes in order to conduct additional developmental tests and Initial Operational Testing and Evaluation. Milestone C was planned for the fourth quarter of FY 2004. Initial operational capability was scheduled during FY 2006 and full operational capability was scheduled for FY 2007. As of 2006 Operational Test of the ABV was to be completed in the 1st Quarter FY 2007. At that time, full rate production was to begin in FY 2007, with Initial Operational Capability to be achieved in the 3d Quarter FY 2007 and Full Operational Capability [20 vehicles] achieved in FY 2008. The Army's FY10 Base procurement dollars in the amount of $63.250 million procured 13 Assault Breacher Vehicles to support the Active Army unit requirements. The Army did not have the capabilities provided by the ABV. The ABV provides the Army and the Marine Corps tracked armored capability to breach minefields, complex obstacles providing in-stride breaching and lane marking capability in HBCTs. The ABV is managed by the Marine Corps Systems Command. Numerous subsystems are purchased through USMC contracts until Army contracts can be put in place. Transition to Army management was planned for FY10. During a joint roll-out ceremony 14 May 2009, Department of Defense program managers commemorated the production of two vehicles intended to help the U.S. military travel in battle at a faster, safer rate. 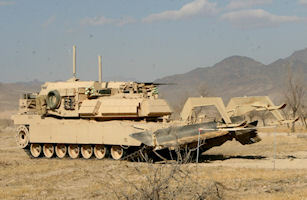 The Joint Assault Bridge and the Assault Breacher Vehicle are tracked vehicles both manufactured at the depot by government civilians for use by the U.S. Army and the U.S. Marine Corps. These two programs are successful because of the partnering efforts of the depot, U.S. Army Program Executive Office and Marine Corps Systems Command. The depot serves as the prime systems integrator for both the ABV and JAB vehicles, introducing a manufacturing process unique for depot employees, as they are most often known for upgrading, overhauling and repairing tracked combat vehicles and Strykers. Prototypes for both vehicles were designed by the Marine Corps. The hulls for each system are from the chassis of refurbished M1 tanks. All other parts and components mated to the hull are new to the DoD inventory. In other words, turrets for the ABV and JAB are made from new materials and not from used tank parts. Anniston can do what industry can do and do it at a better price. The depot workforce is to be commended for its willingness to adapt to new production processes and for its intensity in knowledge and skill when it comes to vehicle manufacturing. These vehicles are produced new in Anniston, Alabama. This new endeavor demonstrates unique capabilities. Already about 30 ABVs had been fielded to Marine units for training purposes. It's designed to breach minefields and complex obstacles and provide a deliberate and in-stride breaching capability for the Marine Air Grounds Task Force and the Army Heavy Brigade Combat Team. The Marine Corps prepared the ABV crew and the vehicle for combat for approximately two years. On the morning of 03 December 2009, the ABV fired its first line charge during Operation Cobra's Anger in Now Zad, Afghanistan. Due to mass amounts of roadside bombs expected around Now Zad, ABV's led the way for the operation by detonating numerous line charges on the path to the Taliban stronghold, Now Zad.